Tooling around on Google, Dan Malouff at Greater Greater Washington stumbled on the above image from suburban Copenhagen. What’s right with this picture? 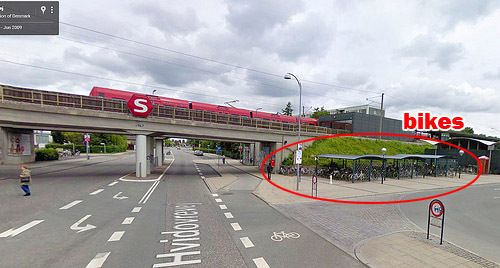 Note the (a) bike parking lot at the Friheden Street transit station, just across the (b) sidewalk from the (c) bike lane. One of the most important uses for bicycles is as a last mile tool, to get from one’s home to a transit station, or from a transit station to one’s final destination. Anywhere you have a transit station with a lot of other buildings a mile or two away, bikes can help connect one to the other. That includes suburbs. If you provide the necessary infrastructure, and treat bicycling like a serious option, people will use it. I admit I’ve never been to Friheden Street. I’ve never even been to Denmark. Frankly I have no idea if it’s a pleasant community, or what the less desirable things about it may be. I’m sure there are trade-offs to it, compared to an American suburb. But I happened to be on Google Earth looking at Copenhagen, which is famously a bike paradise, and wondered what its suburbs look like. I turned on Google’s transit layer and started looking at the areas around suburban stations. Friheden Street just happens to be one I zoomed in on. And look at all those beautiful bike racks. Elsewhere on the Network: Walkable West Palm Beach on why the Dutch don’t need helmets or high-viz clothing to bike (hint: it’s street design), and ATL Urbanist reports that someone on Twitter is trolling Atlanta. To solve the "first and last mile problem," there's no substitute for walkability. First round action continues, as the downtown parking lots by a multi-modal transit hub in the Inland Empire take on a suburban-style shopping center right next to a Chicago train station. Can America Afford Not to Bike More?